A 20-year-old Cambridge man who led police on a 100 mile-an-hour chase around the city has been thrown in jail after posting details of his escape on social media. The incident happened in Cambridge, UK, just after midnight on January 17, 2016, when Connor Lloyd was clocked for speeding in his Honda Civic. When the officers tried to flag him down, Lloyd just kept on going. A chase ensued involving speeds of up to 100 mph, driving on the wrong side of the road, running red lights, and going the wrong way on roundabouts. At one point, he barely avoided a head-on collision with another car. Fearing for public safety, the cops broke off the chase and put out a call for information about the vehicle. Lloyd managed to evade the police that night—and mercifully no one was hurt—but in his infinite wisdom decided to share the details of the incident with his friends on Faceboook. 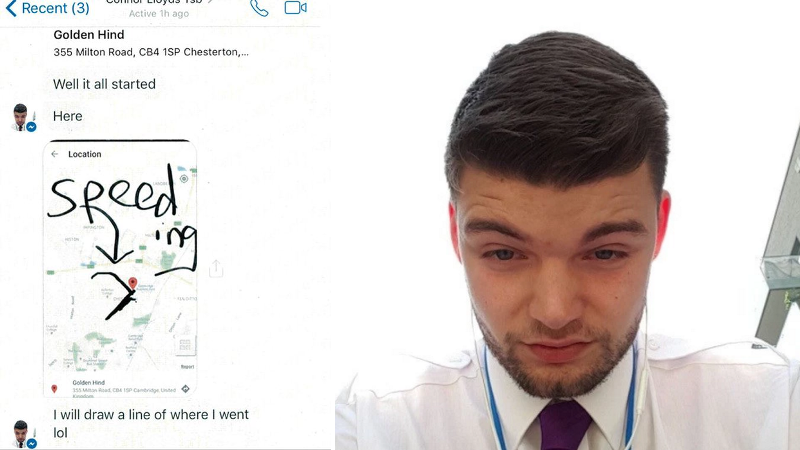 In a Messenger conversation to friend, he crudely sketched-out the route, writing, “I will draw a line of where I went lol.” The young man was even kind enough to provide an arrow, captioning it “speeding.” In another message posted directly to Facebook—since deleted—Lloyd bragged about how he had three passengers in the car, and how he reached speeds of 100 mph during the chase. As reported in the The Telegraph, Lloyd was later caught after the person who sold Lloyd the Civic messaged him on Facebook. He apparently recognized his former vehicle in the police reports. Lloyd boasted about the chase in the ensuing Messenger conversation and was later arrested. It’s not known if this person outed Lloyd to police, or if Lloyd just handed himself in. Lloyd appeared at Cambridge Crown Court late last week, where he plead guilty to dangerous driving. He now faces a six month prison term, and his license has been suspended for a year.